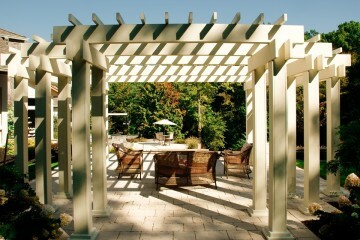 This project was a design and construction project developed for a private residence in New York’s Hudson Valley. The residence was a contemporary stucco home perched on a steep hillside. During design development it was determined that the project would incorporate a custom pool with a spa and infinity edge. 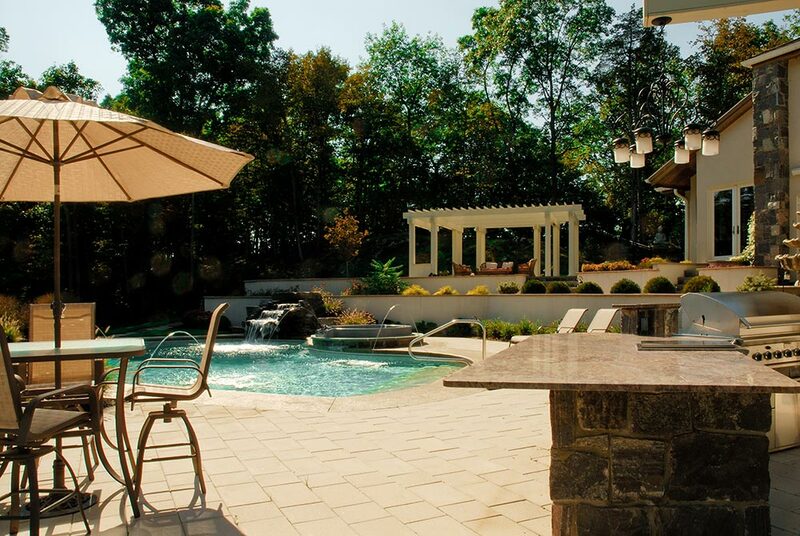 Some of the onsite features that we wanted to take advantage of were the existing ¾ acre pond behind the house as well as the view and potential for an infinity edge provided pool by the steep slope. The slope was also a great challenge that was overcome by the construction of a system of terraced retaining walls. 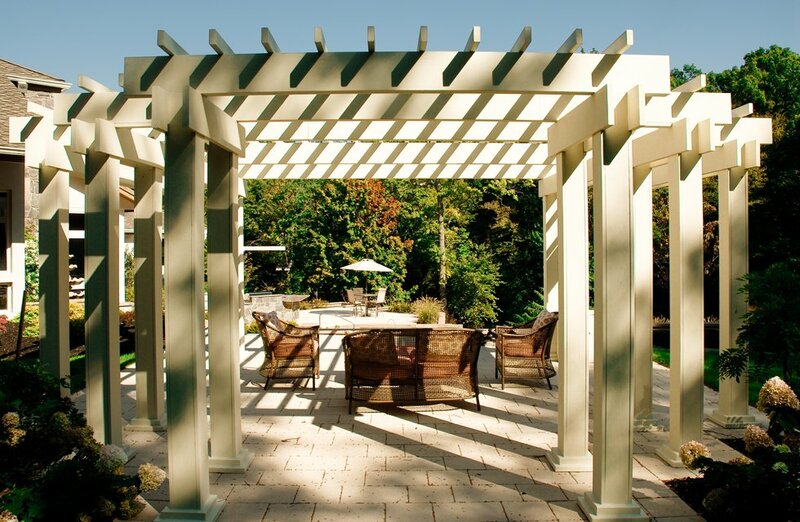 We designed this frequently used entertainment space to include separate sitting areas – one for relaxing in shaded/ protected space and another major area situated in full sun. We incorporated the following elements into the landscape scheme paying particular attention to the human interaction with the space. 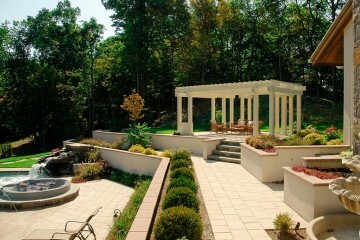 Retaining Walls – approximately 175’ linear feet of retaining walls were constructed and finished with stucco to match the house. The walls were capped with dimensional paving stones that mimicked the flooring on the interior of the house. 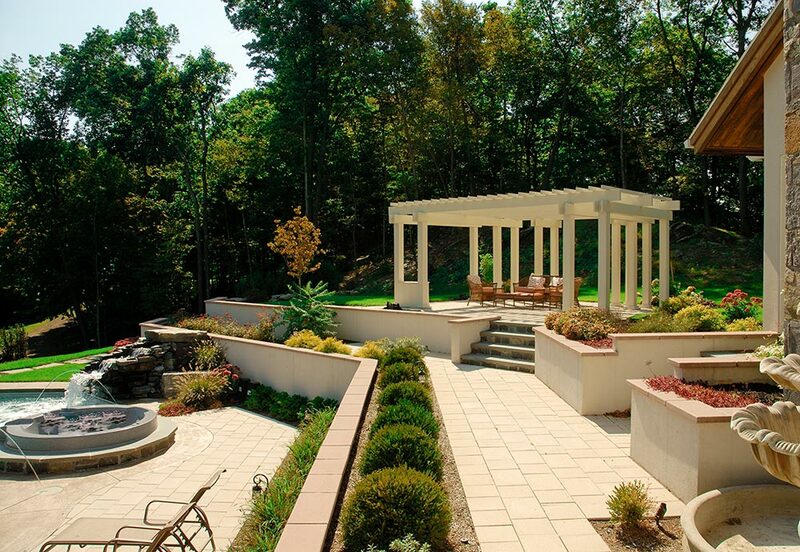 Patios – approximately 1700 square feet of patio and walkways were constructed using Hanover Pavers in a rectilinear pattern. 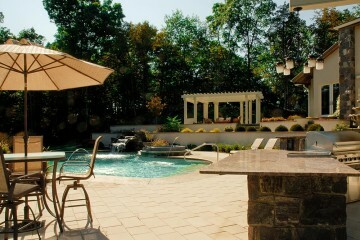 The pattern and color of the pavers coordinated with the contemporary styling of the home. 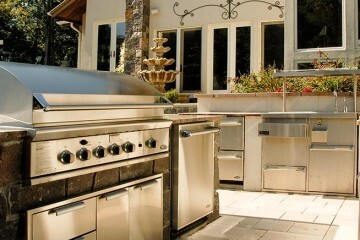 Outdoor kitchen included a 48” stainless steal barbeque, double side burner, warming drawer, two drawer dishwasher, condiment bar, ice maker, significant storage units, sink, hot and cold water supply and all supporting plumbing. The kitchen was veneered with granite to match the existing granite on the house and granite countertops were installed to complete the two separate islands. Significant countertop space was designed to provide for ample cooking and sitting areas. 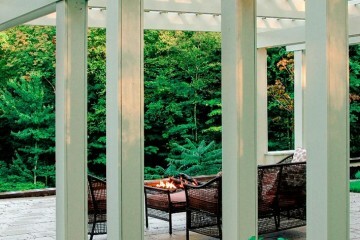 Overhead Structure – a custom designed cedar overhead structure was designed to mimic the adjacent living room of the house. 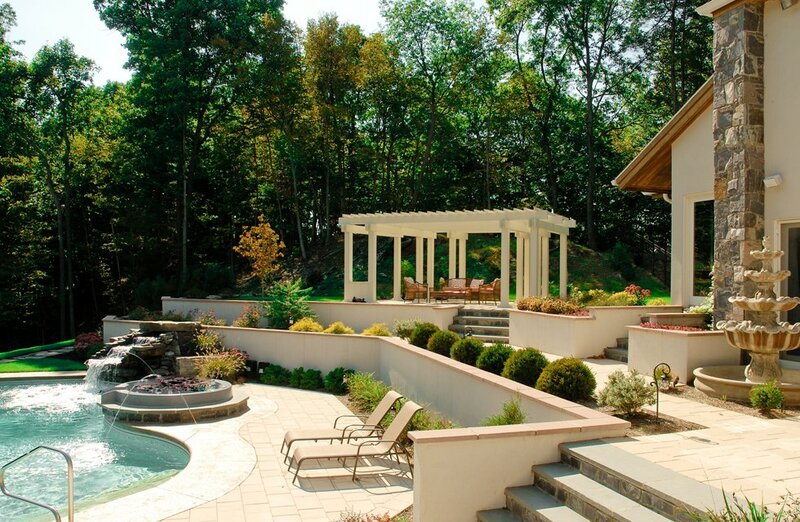 The structure is located closest to the existing woods but also takes advantage of views over the pool down toward the existing pond. 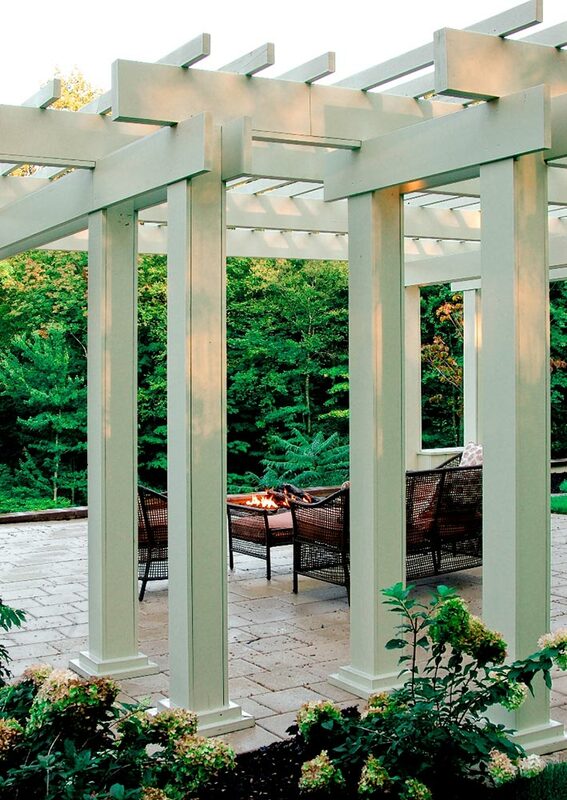 This intimate space also included the installation of a gas fire pit that added to the ambiance of the sitting area. 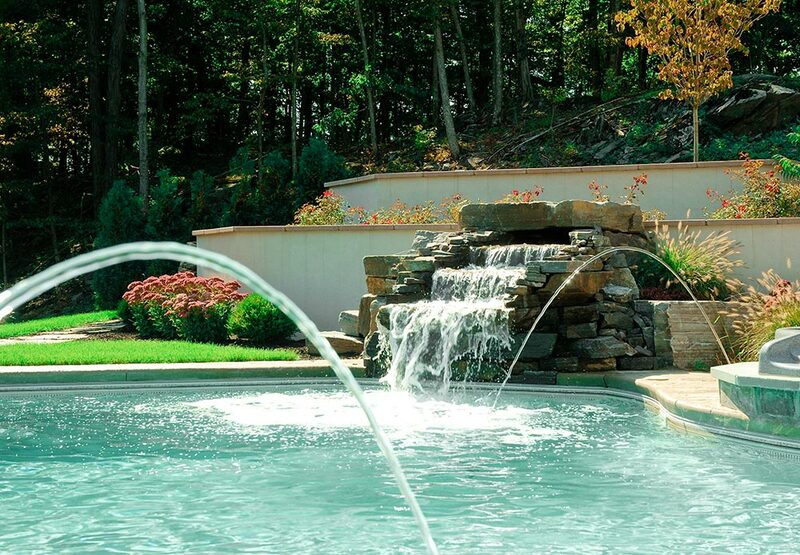 Waterfall – a granite boulder water feature was integrated into the construction of the pool. Not only does it incorporate the sound and movement of water but it also provides for a space to swim beneath and linger under the water spill over. 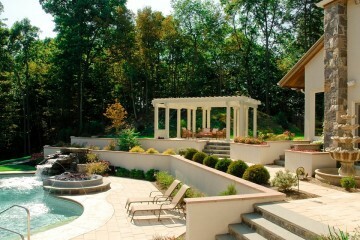 Raised Spa – a 6 to 8 person raised hot tub was included to increase the use of the pool. Infinity Edge – a dominant portion of the project was the integration of the infinity edge on the pool. 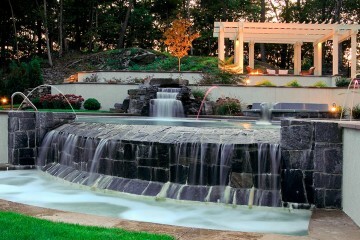 Originally, the design called for the traditional infinity edge but during the course of construction it was decided that the edge should be expanded to create a second larger spa. 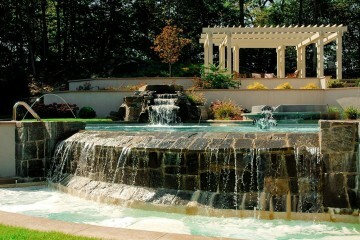 The lower catch pool was expanded by fitting steps into it, including a large bench, jets and additional heaters to modify the temperatures for a spa-like performance. 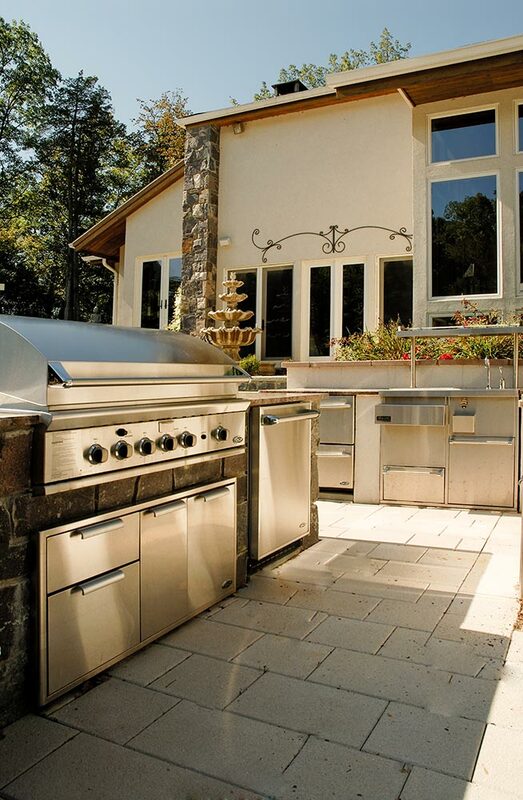 The veneer stone for the spillway was granite to match the stone on the house and barbeque. 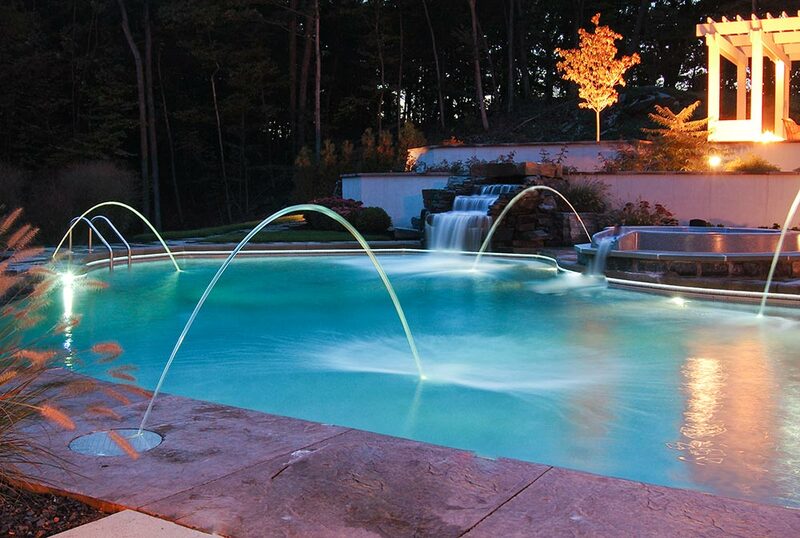 Lighting – a subtle yet effective low voltage lighting system with automated controls was integrated into the entire landscape. A custom designed support system was developed to allow for an iron chandelier to light the kitchen area. 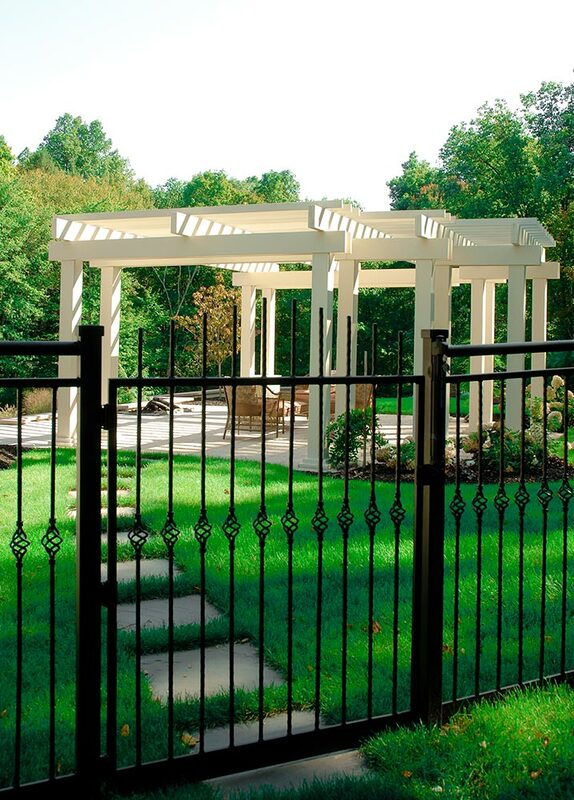 Fencing – approximately 1050 linear feet of chain link fencing was installed to around the entire pond in order for the fence to blend into the woods. 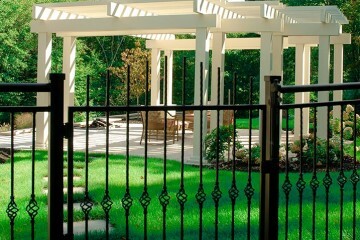 150 linear feet of custom designed/ constructed steel fencing was installed closer to the house to maintain the distinguished character of the house. General Utilities – the scope of work for the project as well as the future potential development of the property necessitated the upgrading of the propane gas service and the electrical service. Approximately 375 linear feet of propane service and 500 linear feet of electrical wiring were incorporated during the course of construction. Additionally, the overflows from the pool equipment were kept away from the pond by directing them into drywells far from the ponds edge. Five existing air conditioners for the home had to be relocated during construction since they occupied too much space and would have added significant noise to the pool environment. Plantings – the project was completed with the installation of trees, shrubs and perennials including Weeping Birch, Fragrant Styrax, Cutleaf Japanese Maple, Redbud, Azaleas, holly, daphne, ornamental grasses, hydrangeas, junipers, microbiota, viburnum and perennials such as creeping sedum, moonbeam coreopsis, scabiosa, sedum autumn joy, liatris, clematis vine, nepeta and others. Limited Access – the relationship of the existing trees, pond and access road resulted in one and only one access point to the construction area. This limited access coupled with the large number of trades involved with the project required significant planning to coordinate the work schedule. 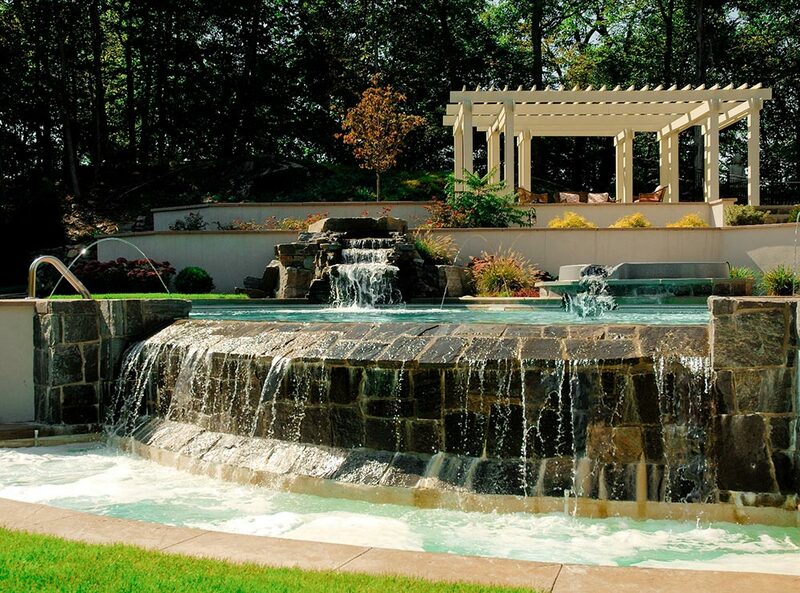 Permit Procurement / Variances – due to the proximity of the pond, additional approvals were required by the governing building office in order to construct the pool within 100’ of the pond. Special provisions were made for the installation of drywells to collect and control pool overflows and backwash and prevent it from reaching and entering the pond. Access Road – due to the unique position of the house on a steep slope access to the construction site was severally limited. A ¼ mile temporary access road was constructed to allow for the delivery of trucks, equipment, materials, etc… to work the site. 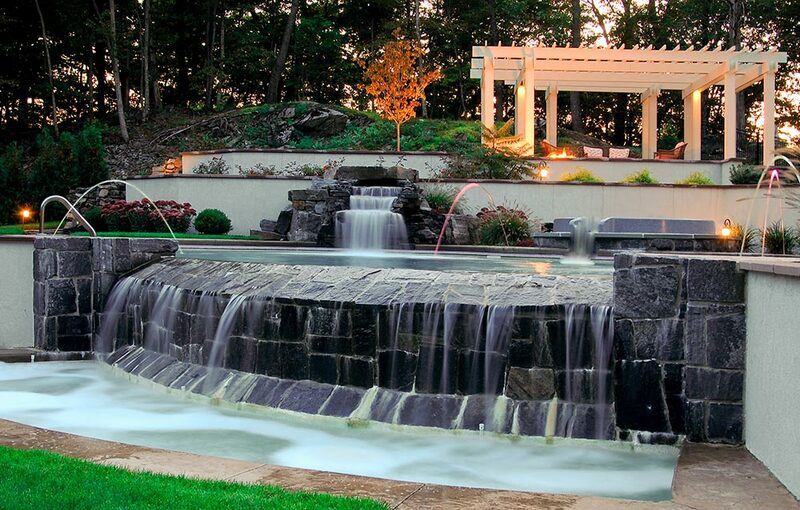 Infinity edge – in the midst of construction, the client requested the removal of the existing hot tub that was already constructed into the pool. He wished for something larger that would allow for more people. Due to the fact that the spa was poured into 20” of concrete and connected to the pool walls this would have been disastrous. Rather than compromise the integrity of the pool and to maintain a reasonable timeline it was decided that the lower catch basin of the infinity edge would be converted into a spa with a seating bench, access steps, jets and additional pool/ spa equipment.